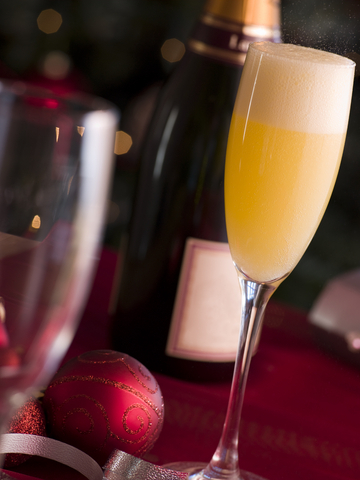 The Buck's Fizz is an alcoholic drink made with orange juice and champagne. Some older recipes list grenadine as an additional ingredient, although the International Bartenders Association recipe does not include it. The drink is named after London's Buck's Club where it was invented as an excuse to begin drinking early, and first served, by one of its barmen, McGarry, in 1921. The Mimosa cocktail, invented four years later in Paris, also contains sparkling wine and orange juice albeit in different measures. Buck's Fizz is popularly served at weddings as a less alcoholic alternative to Champagne. Pour the orange juice into a champagne flute and top up champagne. Stir gently, garnish with orange twist and serve straight up; without ice.